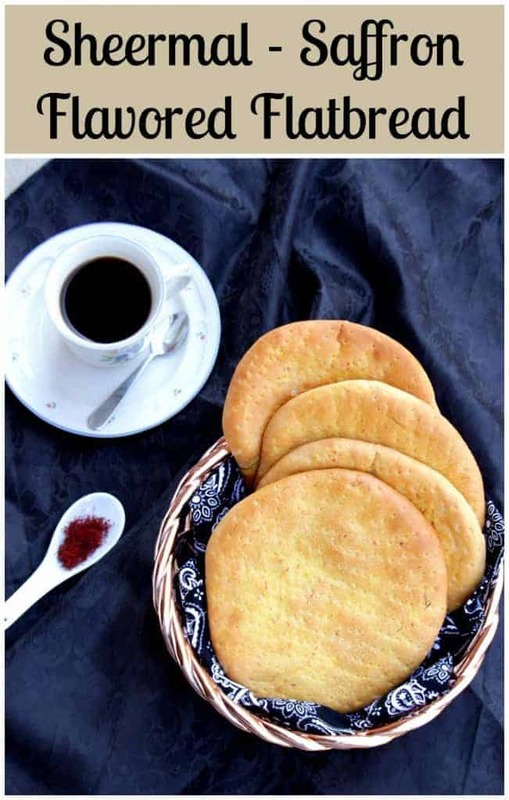 Sheermal / Shirmal is one of the breads that was in my bookmarked list for a long time. We used to bake different breads each month with a group called ‘We Knead to Bake’ and this bread was one of the breads we baked in the group. I had missed baking with the group that particular month but had it bookmarked ever since then. 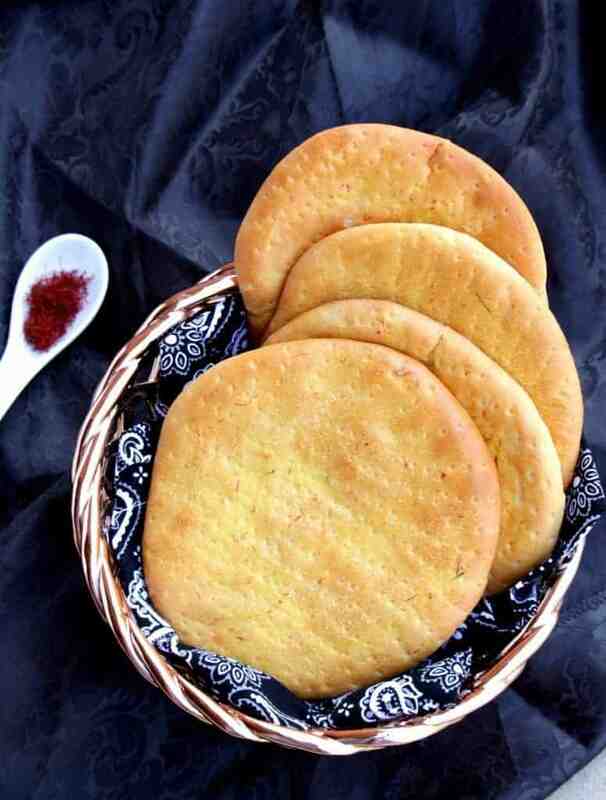 Sheermal is a saffron flavored flatbread which is believed to have passed on to India from the Persian culture. 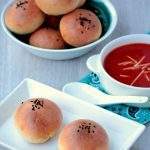 This bread is very famous in the Muslim community in India and hence is assumed that this has been passed down from the Persian culture. 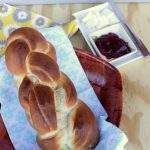 This bread is very flavorful and leavened with yeast. There are recipes that have egg in them, but I have made this recipe Egg less and used yogurt as a substitute for eggs. 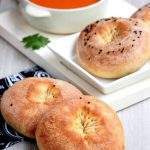 The bread is usually served with tea for breakfast but is also served as a part of the main dish along with a spicy Mutton curry called Nehari/Nihari. Sheermal is usually flavored with kewra (screw pine essence), but it is a very acquired taste. You could use rose water instead, but that again is an acquired flavor. I have left out both the kewra and the rose water and just used the saffron milk. We ate the Sheermal with our evening tea and it was a very satisfying snack. I am going to make it again very soon for dinner with some spicy subzi as I really fell in love with this bread. 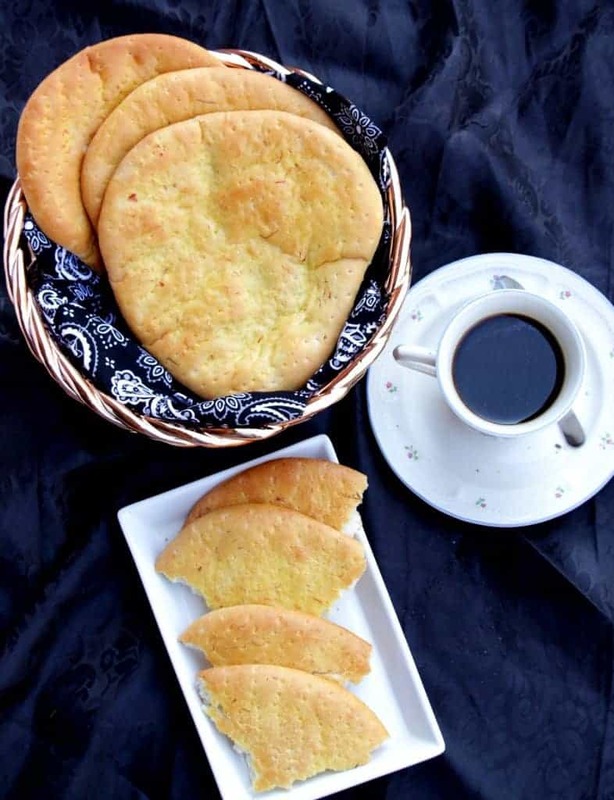 It is very similar to the Indian naan, but a little more rustic in look. 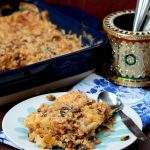 The Lucknowi Sheermal is topped with raisins or any dry fruits. 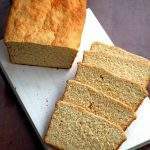 There are some who top the sheermal with nuts or sesame seeds. Heat the water to lukewarm temperature and add the yeast along with a teaspoon of sugar. Mix it well and cover with a cloth. Let the yeast proof for about 7-10 minutes or until it becomes bubbly. If the yeast mixture does not froth up by the end of 10 minutes, discard the mixture and start with a new batch of yeast. In a large mixing bowl, or in the bowl of the stand mixer, add the rest of the dry ingredients; all purpose flour, sugar and salt. Mix it and then add the proofed yeast mixture. Add the melted butter or ghee and the rose water, if using. Add the milk slowly to form a soft dough. 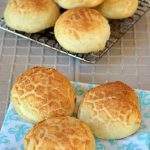 Knead the dough for 7 to 10 minutes. The dough will be very soft, but not sticky. 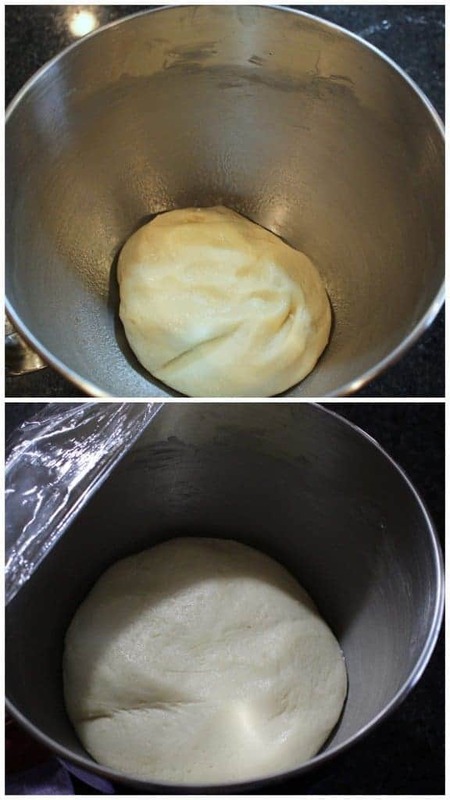 Place the dough in a greased bowl and cover it with plastic wrap and then a kitchen cloth. Let it rise in a warm place for about an hour to hour and a half. 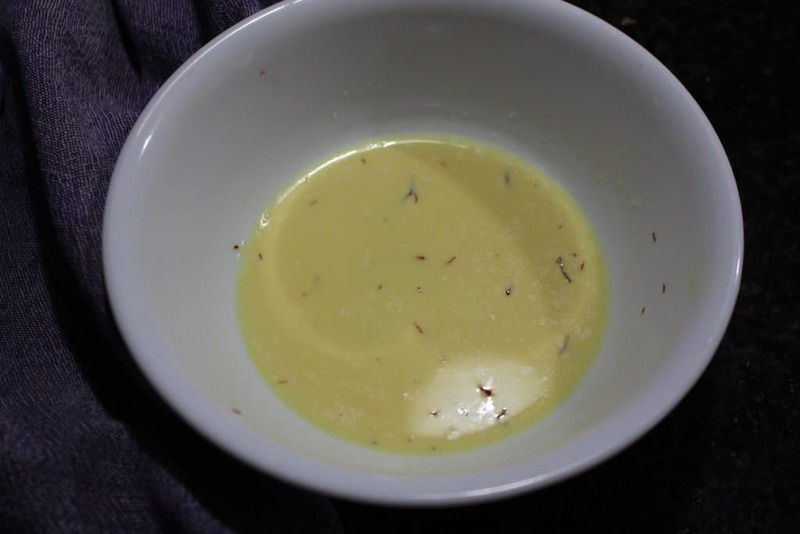 In a small bowl, heat the 2 tbsp of milk and add the saffron strands to the milk. Mix it well and let it sit for about 5 minutes. Once the dough has doubled in volume, punch it down gently and then divide it into 4 equal balls. Working with one ball, flatten it evenly to about 6 to 8 inches circle. You could use a rolling pin, but I found using the hands to flatten worked much better. 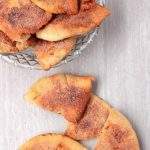 Place the shaped dough on a parchment lined baking tray. Repeat the same with the rest of the dough pieces. 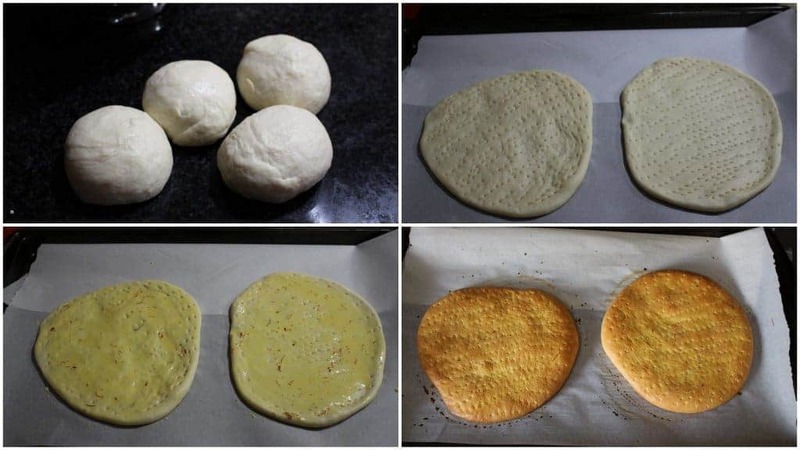 Using a fork, make prick marks evenly all over the dough. 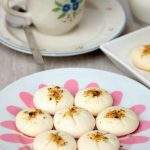 Using a pastry brush, evenly brush the saffron milk all over the shaped dough. Make sure you brush the saffron milk liberally over the shaped flat bread. Bake in the preheated oven for 15 to 20 minutes or until the Sheermal is golden brown in color. Do not overcook the bread. Keep an eye from about 12 minutes as the cooking time vary from oven to oven. Cool on rack for 5 minutes and then place wrapped in a cloth to retain the softness of the bread. Sheermal is on my to do list too since so so long , after seeing your fantastic bread , I am motivated . Saffron flavour sounds great though I wouldn’t mind Kewra or Rose and yes those nuts too . 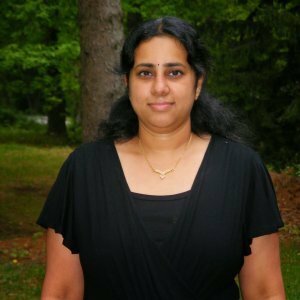 Sandhya I make this flatbread quite often. Simply love it especially with a mughlai dish. 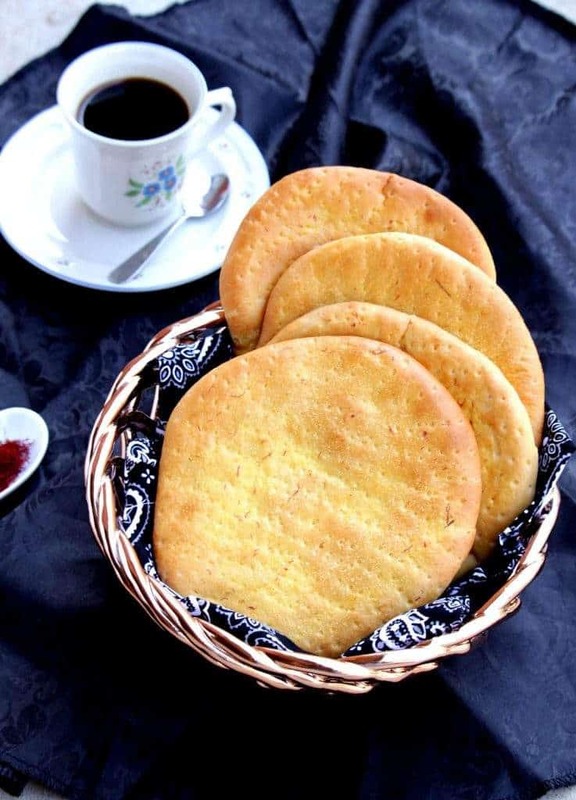 Tastes great even with a cup of masala tea. Gorgeous color from the saffron and must have tasted delicious. 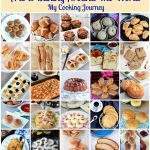 I did come across this when I was making my list and decided to do it another time instead of a marathon bake. I have a whole other list for post marathon baking ? 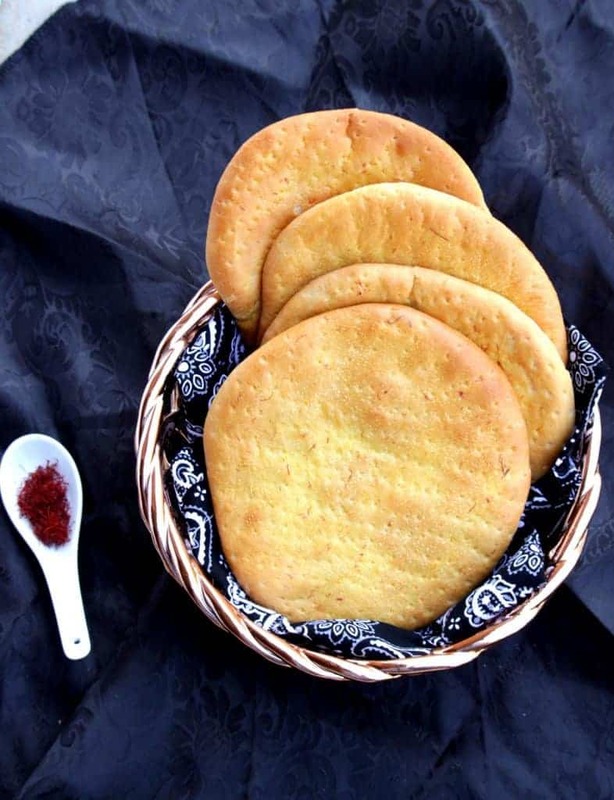 Sheermal rocks, saffron and rose water makes this flat bread more flavourful and fantastic. Just love this flatbread. Very flavorful with saffron and rose water! Sheermal sounds like a royal flatbread and would pair well with any curry. 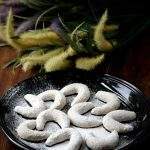 I had made these long time ago and wanted to try it for the marathon, but ended up making something else for letter S.
Your Sheermal look so soft and delicious. You are tempting me to try these some time soon. Sounds yummy and the saffrons infused breads are just out of the world! !